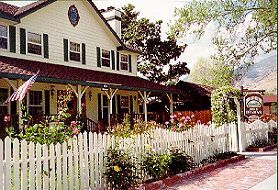 The Kern River Inn Bed & Breakfast is a charming, romantic, classic country Bed & Breakfast Inn offering lodging on the wild and scenic Kern River in California's southern Sierra mountains, ideal for relaxation--or recreation! Located only three hours north of Los Angeles! All bedrooms have private baths and feature river views. Most rooms have fireplaces or whirlpool tubs. Full breakfasts are featured, all with a gourmet entree. Guests may walk to a museum, restaurants, shops, and parks. And, it's only a short drive to giant redwood trees! Many guests enjoy the outdoors, and like the flavor of adventure. The Kern River valley is an all-year vacation playground with whitewater rafting, golf, fishing, kayaking, skiing, hiking, biking and windsurfing--even gold panning! The inn is open year-round and offers and offers AAA, Business and Senior Discounts. AAA 3-Diamond Rated. Rates: $99-$109 Double Occupancy. Wheelchair accessible. No smoking. No pets. Visa, MasterCard, Discover and American Express cards accepted. This and other Kernville Bed and Breakfast Inns can be found here in The Register.